For today's post, I am not merely recommending one NYC restaurant, but 52. That's right, 52 - as in the number of weeks per year, or the number of playing cards in a standard deck (minus the jokers). I would like to introduce The Diner's Deck, by City Shuffle. 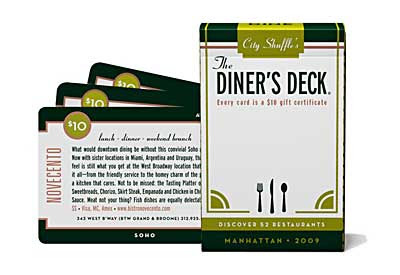 The Diner's Deck consists of 52 cards, each card being a NYC restaurant pick and a $10-off coupon at that restaurant. (With 52 cards, theoretically one per week, that is a savings of $520 if you were to try every restaurant. The deck itself costs $29.95). The restaurants range from great burger and fry joints to upscale Argentine, and all seem to be great discoveries. I've explored the City's restaurants for two years using The Diner's Deck as my guide and none of the restaurants have disappointed. If not even for the $10-off coupon, the deck itself is simply a savvy guide for choosing a new restaurant. Each card gives a short restaurant description (often times suggesting an extra-special dish), the cuisine, the price range, the address and website and the neighborhood. Sort them and methodically try each restaurant, or be wild and pull one randomly from the deck. This is a fun way to break the usual habit of going to that same neighborhood Vietnamese place each weekend. You can buy decks for Manhattan restaurants, Downtown Manhattan and Brooklyn restaurants, or Manhattan bars & lounges. The deck is valid for the calendar year, so start the new year off right and pick up a 2009 deck today!